Partner Jeff Matthews is a veteran family lawyer who has practiced family law in Oregon for over 30 years. 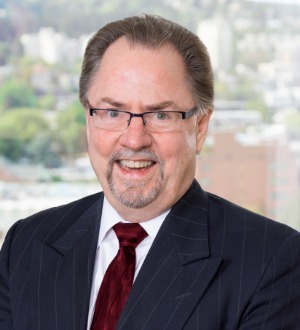 He has distinguished himself as one of Portland’s most respected divorce and family law attorneys with his leadership, professionalism, and interdisciplinary approach to family law. Jeff is a longtime Fellow of the American Academy of Matrimonial Lawyers and current President of the AAML Oregon chapter. Jeff focuses his practice on financially complex divorce cases that include the valuation and protection of estates with high net worth, business interests, and other property distribution issues. He is also skilled with high conflict custody litigation. Before joining McKinley Irvin, Jeff was a shareholder at Yates Matthews Family Law for 17 years and previously was a partner at the Portland family law firm Gevurtz Menashe. As a family law attorney, Jeff views his role with his clients as twofold. First, he serves as a guide through a huge life transition, seeing them through to the next chapter of their lives as whole as possible. Second, he is his client’s zealous advocate, committed to protecting what they value most. He has earned a reputation in the legal community as a successful advocate by focusing first on cooperative communication with the opposing party and their counsel. Jeff knows that this approach often results in a quicker and less costly legal process. When necessary, however, he is no stranger to the courtroom, having represented clients in over 100 trials and hearings over the years of his practice. Jeff is committed to the community and has served with a number of non-profit organizations that aid those in need. In 1997 Jeff founded Oregon Lawyers Against Hunger which over the years has now raised over $2 million for Oregon Food Bank. When he’s not working, Jeff loves the outdoors, often accompanied by his dogs – Chester, a Golden Retriever and Amos Lee, a Bernese Mountain Dog. He very much enjoys literature and music; has completed seven marathons; barbeques in the rain and is an uncompromising Ducks fan.